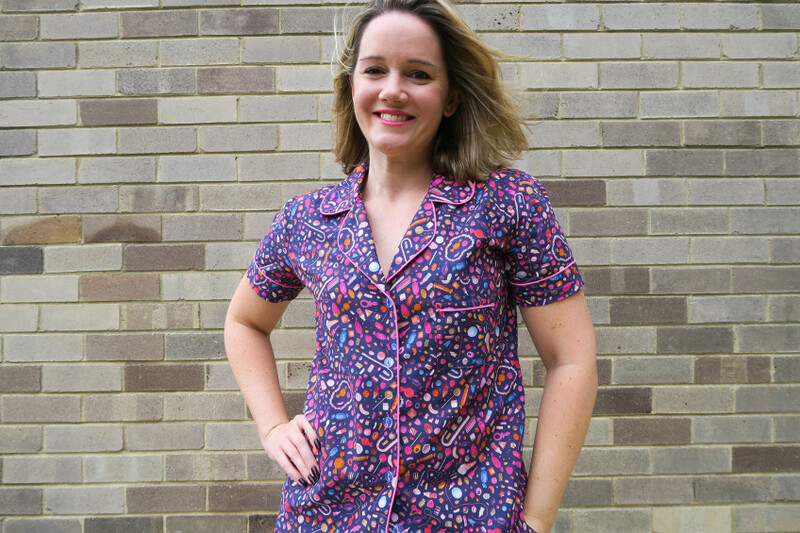 It’s a pyjama party for one right here! 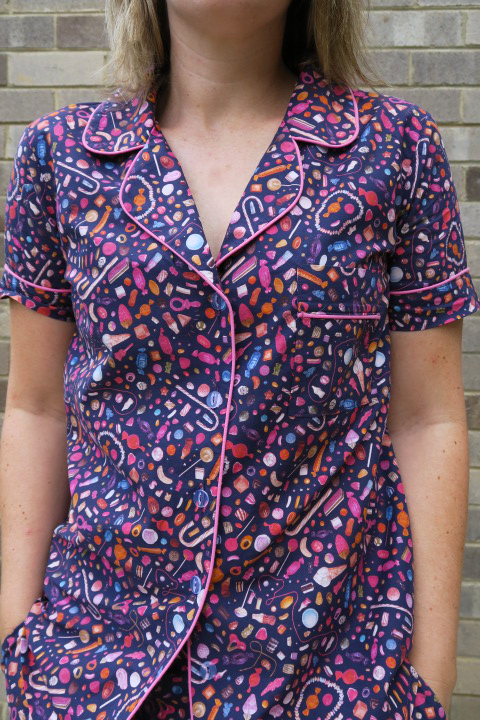 After contemplating making these PJ’s in…umm…forever, I finally made them. I’m not sure why I delayed it so much, especially given how happy I am with the result. At a guess it might be because I love shopping for PJ’s. 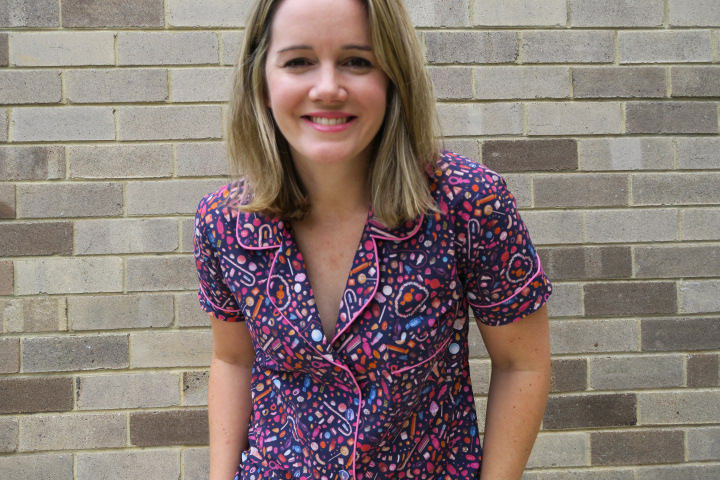 Peter Alexander's PJ's have been a firm favourite in my wardrobe for the past 20 years. And it could also be because I hadn’t landed on what fabric to make them with. I wanted to buy a cotton fabric that would be comfortable enough to sleep in, as I find a lot of apparel cottons too stiff for bed wear. 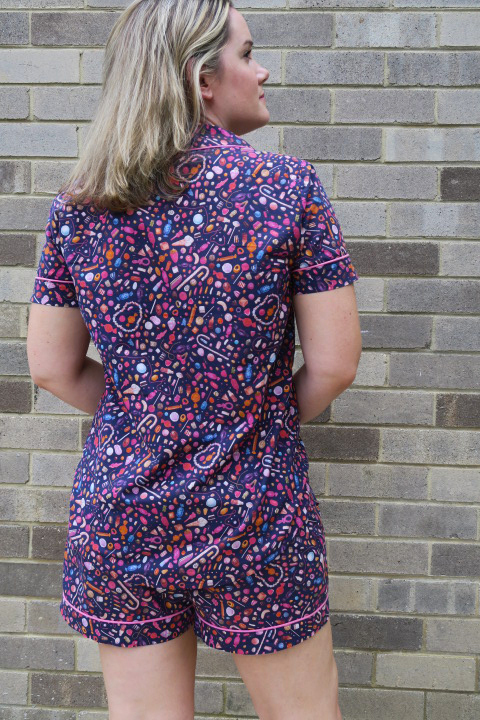 The lack of fabric choice became a moot point when I stumbled across some fun Liberty print that I had to have, but also realised I probably wouldn’t want to leave the house wearing. It was also around this time I found the Closet Case Files Carolyn PJ pattern in a fabric shop in the UK for sale. I snapped up the pattern and the fabric and added them to my already massively-too-full suitcase and headed home. 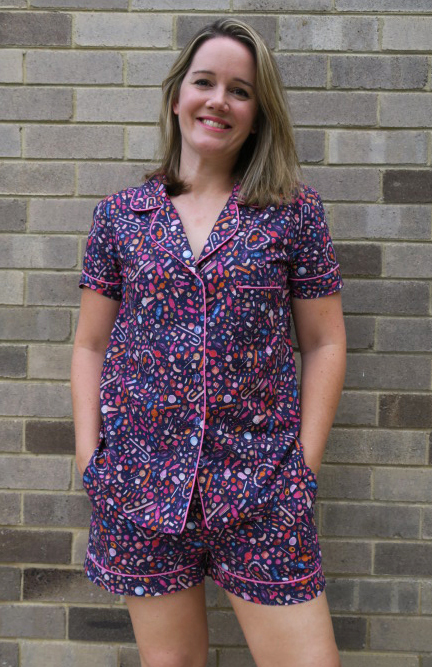 Liberty tana lawn is a great option for these PJ's because the cotton is soft and light to wear. It also happens to be one of my favourite materials to sew with. For the PJ's I cut out a size 14 for the bottoms and a size 10 for the top. I decided on the sizing based directly from the pattern envelope, and not from the pattern pieces. I opted on the side of caution because sleeping in slim fit PJ's just isn't for me. I elected to add the piping option, and managed to pick up some coordinating pink piping on Etsy. It's always a gamble buying these things on line and fearing the colour on the computer screen doesn't look like what comes in the post. But I still prefer that option, rather than having to make my own. Especially so much of it! Is it just me, or is pre-made piping hard to find in Australian sewing stores? I'm hoping during my visit to Japan in 5 weeks will lead me to some awesome trim shops and I'll just buy up a stack for future projects. There is quite a few pieces to this pattern, so my sewing room floor was taken over during the construction making sure I hadn't neglected to cut out a piece. The boxer bottoms came together really quickly and the fit turned out perfectly for me. The bottoms are super flattering. They almost hug your bottom so you don't feel like your cheeks are hanging out. The top was more challenging to pull together, particularly around the collar and neck facing. It took about 2-3 goes to get it right. Thankfully tana lawn and seam rippers go quite well together and I didn't end up ruining the fabric. From a fit perspective, I didn't have to make any adjustments - winner! Although it's worth nothing that I sewed a narrower seam on the sleeves to accomodate my bigger biceps. I finished off the top with clear buttons down the front. I was tempted with going for pink buttons but I thought it may be a little overkill. And seeing the outcome now, I'm glad I went with clear. Overall, I am really happy with how these turned out. In fact, I think I pretty much love them. I can almost guarantee there will be another pair in the works before the year is out with long sleeves and long bottoms, to carry me through the Winter months. Thank you Heather! This looks lovely on you! I have this pattern as well, I still haven't got round to it, perhaps later this year. Oooh...these are so cute! The piping turned out to be a perfect match for your beautiful fabric! I have this pattern and really must make it up soon!